Help out with The Market Match Fundraiser on Indiegogo! Hi, I'm Frank Tamborello and I'm one of a team of people in Los Angeles who believe that eating healthy should not just be for the wealthy! Hunger isn't just about having enough food, it’s about having access to enough healthy food. After looking into programs in other parts of the country that doubled the money of people using CalFresh (what we used to call Food Stamps) at farmers markets, we began raising money for a program that farmers coming to Los Angeles could benefit from while offering more food to those who needed it. Many low-income families can't afford the basic fruits and vegetables needed to be healthy, that’s why diabetes and obesity are two of the worst diseases facing our country today. It's not the amount, but the poor quality of food that leads to poor health. Today our Market Match Program allows low-income families using food stamps to get up to $10 in vouchers extra per week to spend on fresh fruits and vegetables at farmers markets–amounting up to $50 a month! We expanded to other low-income populations as well, especially seniors getting Supplemental Security Income pensions. When a customer comes to the market with only $5 dollars in cash or EBT, we can match that amount to $10 dollars using Market Match vouchers. They can then use the vouchers to buy twice as many fruits and vegetables. This creates a higher demand for healthy foods to be sold at farmers markets, keeps low-income families and seniors healthy while helping small farmers sell more produce. Without the use of pesticides or chemical fertilizers, thousands of small farmers are growing nutritious food and keeping our environment healthy as well. They sell their bounty weekly at farmers markets all over Southern California—120 markets in LA County alone! But when you say “farmers market” people think of overpriced items that are nutritious but could not fit into the budget of a mom working part-time to raise three kids, a person with disabilities living on a monthly benefit or a senior struggling to pay their rent. California should not have this problem. We're growing over half of the nation’s fruits and vegetables! Here in Southern California we've grown from one market in LA to a total of 16 with our colleagues doing the program at 5 others in LA, and a total of 230 markets around the state! The Recession and the Affordable Healthy Food movement: Market Match. Several years ago a group of concerned residents formed Hunger Action LA to address issues of both hunger and healthy eating. The 2008 recession resulted in Food Stamp use being doubled all over the USA. Los Angeles' large population of struggling working families, the unemployed and seniors trying to make it on small pensions needed access to healthier, more affordable food. We knew there must be a way to help farmers grow more healthy foods low-income families could afford. Farmers markets in California originally begun (after a campaign to establish them as legal) in the 1970s, as a way to help small farmers sell goods in low-income areas that needed more organic fruits and vegetables. Unfortunately, over the years they had a reputation of being places where only people who could afford luxurious food items could shop. But kale, collard greens, white radishes, tomatoes, and avocados aren't just for the wealthy! Every person should have access to healthy foods regardless of their income, and Market Match levels the playing field. This is a critical time. We need to spread Market Match to all corners of Los Angeles county and attract the support needed to make it a permanent and sustainable program. People are flocking to the markets for healthy food that won't break their budget, but we still don't have enough resources to meet the rising demand at the markets—as a result we're forced to limit the number of vouchers we distribute. We need to raise more funds to meet the needs of the senior and disabled population. We also have new funding sources, but unfortunately we can't access them until we advance money to the markets. Finally, we want to increase the amount we distribute at existing markets and especially to add markets in Los Angeles. By making a donation you'll be helping our small California farmers, many having to cut production due to the drought. Unless they get more income on a regular basis, they won't be able to afford to keep driving to L.A. to sell at the markets. We could see a loss of environmentally sustainable farming and a loss of affordable farmers markets in our urban areas. Help thousands of families, seniors and people with disabilities get a dignified healthy diet that will help the farmers now struggling with the drought who are bringing this great food into Los Angeles. You can be part of this program and get the recognition you deserve for making L.A. healthy and hunger-free while giving California’s farmers the boost they need! Come out to a Market Match site and see for yourself! Take a glance at the LA Times article from the Saturday, July 25 print edition. With your help, we can make EVERY farmers market look like Adams/Vermont! We have a lot of great perks for you if you can contribute! —If you or your group can raise $1,000 we will acknowledge you at the market of your choice with a full-length banner on one particular market day. We want everyone to know that YOU made it happen. —If you are interested in learning more about the fight against hunger, for a $20 contribution you'll receive Joel Berg's book "All You Can Eat: How Hungry Is America? ", which will give you some of the real reasons we have hunger in such a wealthy country. Joel is director of the New York City Coalition Against Hunger and former Clinton administration official who pulls no punches in this excellent book. —For a $40 contribution you will receive: The intersection between art and hunger, a DVD of author/playwright Dan Froot's innovative tabletop theater piece "Who's Hungry?". Dan translates the true stories of people who have experienced hunger in modern America into miniature dramas using small puppetlike figures. A truly unique art form. Plus a copy of Joel Berg's book "All You Can Eat: How Hungry is America? Described above. —Oh yes, show people what your support with pride! We have T-shirts, tote bags, water bottles and flash drives. All items sport the Hunger Action Los Angeles Logo–make it memorable! Help us spread the word! If we don't reach our entire goal, the funds will go to one of the four potential sites listed above. This program will inspire people in our market areas because those who have to watch where every penny goes will be getting twice as much for their money at their local farmers market. And remember, every dollar does two things: it helps a low-income family eat better AND helps a farmer bring more of the good stuff. 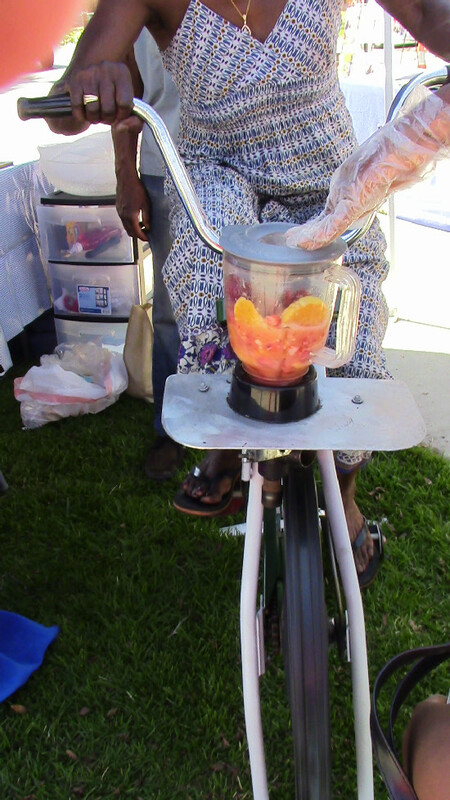 Hunger Action LA has successfully begun Market Match at 16 farmers markets in LA County since 2010. We've done it methodically and responsibly on a limited basis when finances made that necessary. Making sure that we had capacity and volunteers to make the program run well, dealing with problems as we went along and building a strong coalition among the market operators who run the farmers markets. We've partnered with numerous organizations and have attracted funding from First 5 LA and from the US Department of Agriculture through the Ecology Center, an organization working to build Market Match across the state. But we cannot and should not rely on large funders alone. We want a sustainable program that belongs to the people of LA County. This program is built from the ground up by ordinary people pioneering a new and exciting approach to four things: fighting poverty, improving public health, supporting California’s great asset of small acre farms and in so doing, promoting environmentally sustainable farming methods. That’s why we call Market Match a Four-Way Win-Win-Win-Win! Raising money for this program isn't easy–a lot is needed for us to meet the demand here in LA., but many people share our dream and it’s not impossible! Michigan has implemented a program just like this statewide. If Michigan can do it why can't California? You can be an important part of making the dream really come true! If you can't contribute, you can still help! Get the word out and MAKE SOME NOISE about our campaign. Share the LA Times article and spread the email out to your friends & social networks. And let us know if you'd like to volunteer distributing Market Match at one of the participating markets! Every contribution is appreciated. If you can only give $10 you have helped one person, one struggling mom, or one hungry senior get Market Match for a day. Contributions give farmers more hope to keep raising great produce through the devastating drought. Even ten dollars can go a long way at a market like Adams/Vermont or like the new target markets on our list. Contributions can make a healthy soup or provide vitamin filled snacks for kids to munch on! Plums instead of corn chips! An avocado instead of a cream filled cake! and that's all there is to it.